The best way to get the benefit from volatility is investing in mutual funds via Systematic Investment Plan (SIP). 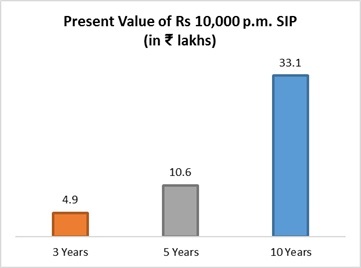 SIP is a way to invest via which investors can invest a fixed amount in a mutual fund for a defined period. SIP helps investors in ‘Rupee Cost Averaging’ and follow a disciplined approach without worrying about the short-term volatility in the market volatility. Investors can also make significant returns in the long-term as the India growth story is still intact. Economic growth is expected to revive in FY19 after subdued growth in FY18 due to the twin shock of demonetization and GST transition. Now, as the impacts of the twin shocks have receded, corporate earnings are also expected to grow in mid-teens in FY19. However, the markets have already factored in the recovery in the earnings in the valuations. Therefore, investors should focus on the longevity of investments since the market has entered in a consolidation phase. The equity market has been volatile so far in 2018 due to rising crude oil prices and bond yields, uncovering of governance issues in banks and the possibility of four rate hikes in 2018 in the US. Therefore, investors should use the current volatility as an opportunity to create wealth in long-term. The best way to get the benefit from volatility is investing in mutual funds via Systematic Investment Plan (SIP). SIP is a way to invest via which investors can invest a fixed amount in a mutual fund for a defined period. 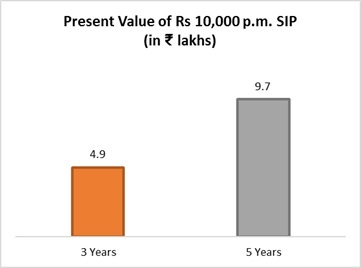 SIP helps investors in ‘Rupee Cost Averaging’ and follow a disciplined approach without worrying about the short-term volatility in the market volatility. Besides, investors can invest as low as Rs 500 in a scheme per month. Below are our top recommended mutual funds to investors to create wealth in long term. It is an equity-oriented balanced fund, which does tactical allocation between debt and equity, based on the market outlook to ensure optimal risk reward. As of March 2018, the fund had invested ~67% of AUM in equity to give steady growth over long term, while ~26% is allocated to debt investments to cap the downside risk. 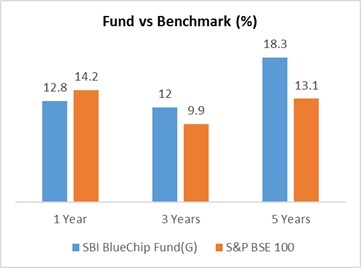 The fund has invested ~60% of the AUM in large-cap stocks, while ~7% is invested in mid-cap and small-cap stocks. Investors who want to follow balanced approach i.e. 65% equity and ~35% debt can invest in the scheme to create wealth in long term. It is an equity fund, which primarily invests in top 100 stocks by market capitalization. The fund invests in companies which have significant market share and are market leaders in their industries. Investors who want to primarily invest in large-cap stocks can invest in this fund to create wealth in long term. It is an equity fund that invests in high conviction stocks, maximum 25 stocks, from top 200 stocks by market capitalization. The fund invests in quality companies with credible management, sustainable profit growth and cash flow, and having clean balance sheet. As of March 2018, the fund had invested ~62% of AUM in large-cap stocks and ~32% was allocated to mid-cap and small-cap stocks to give steady growth over long term. The fund had highest allocation to Private Banks (~18%), followed by Auto Ancillary (~9%) and IT-Software (~8%). Investors who want to take exposure in high conviction large-cap and mid-cap stocks can invest in the fund to create wealth in long term. 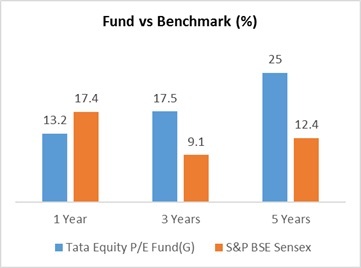 It is a value conscious equity fund, which aims to invest 70-100% of its AUM in stocks whose 12 months rolling PE ratio is lower than 12 month rolling PE ratio of BSE Sensex. The remaining AUM is allocated in other equity and debt instruments. 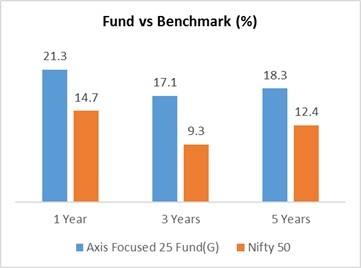 As of March 2018, the fund had invested ~60% of AUM in large-cap stocks and ~28% was allocated to mid-cap and small-cap stocks to generate higher returns over long term. The fund had highest allocation to Private Banks (~8%), followed by Finance-Housing (~8%) and Refineries (~7%). Investors who are value conscious and want to invest in large-cap and mid-cap stocks can invest in the fund. It invests in stocks beyond top 100 companies, based on market capitalization. The fund manager invests in small-cap and mid-cap stocks with consistent earnings and significant growth potential. He follows bottom-up approach to select the stocks. 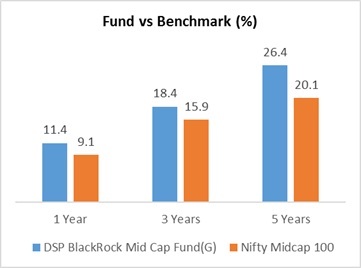 As of March 2018, ~58% of its AUM was invested mid-cap stocks, ~21% was invested in small-cap stocks and ~15% in large-cap stocks to generate high returns for investors. 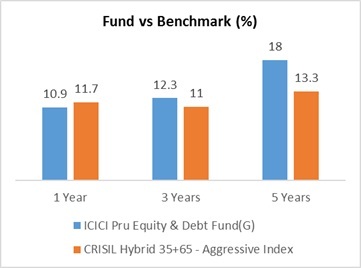 The fund had highest allocation to Private Banks (~9%), followed by Pharma (~8.8%) and Finance-NBFC (~6.5%). Investors who want to primarily invest in mid-cap and small-cap stocks can invest in this fund to create wealth in long term.